DC makes a bizarre choice for its first Arkham City Batman figure. A new line of Arkham City action figures has done something a little unexpected and revealed Batman's face. The line, which also features Robin and Harley Quinn, shows Batman in full costume with his mask pulled back, so everyone can see that he is, in fact, Bruce Wayne. I must admit that I don't know a whole lot about selling action figures, but I would have thought that the first figure you'd want of Batman would be him with his mask on, with the variants - such as with the cowl pulled back - saved for future series. It's like releasing a figure of Superman in his black and white Kryptonian get up before releasing one of him in his traditional red, blue, and gold costume. It also seems a little weird that there isn't a figure of Catwoman in there, seeing as she is every bit the playable character that Robin is. It's the first series, so more figures will probably follow, but she seems like a strange omission. 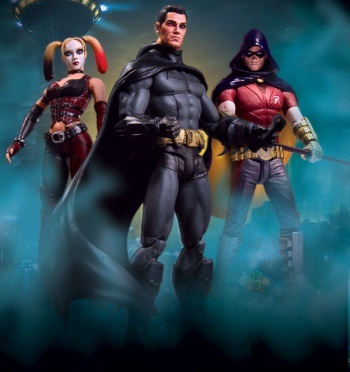 Some are speculating that this action figure may actually be a spoiler for Arkham City itself, and the game will feature a scene where the Dark Knight pulls back his mask. Personally, I think that if we do get to see Bruce Wayne's face, it will be during some cinematic while he's sitting in the Batcave figuring out what to do about Arkham City. Then again, Talia al Ghul is in the game, as she already knows who Batman is, so maybe he does take his mask off at some point. Batman: Arkham City comes out for PS3 and Xbox 360 on October 18th, and for PC in November. The figures will be available on December 21st.